Konigstein or Kings Rock is a mighty fortress that towers above the Elbe in Eastern Germany. 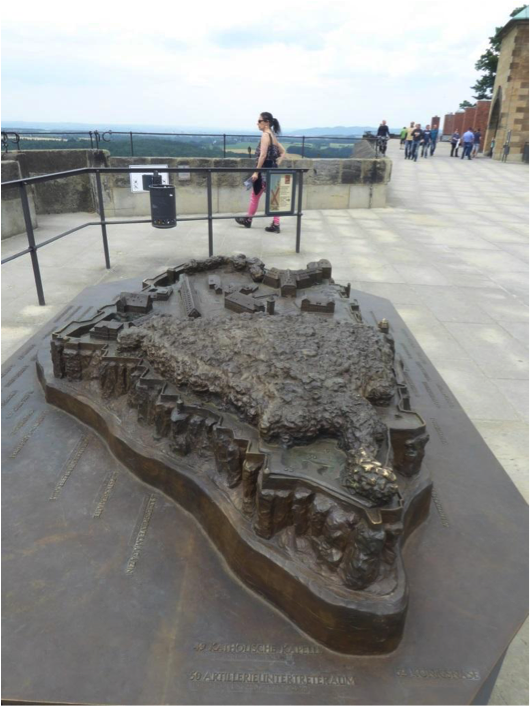 It is located about an hour’s drive from Dresden and formally served to defend the route into Saxony along the Elbe. It impresses in many ways; the ramparts are 40 metres high and have a circuit of 1.8 kilometres, excluding the out works. The entrance is the strongest I have ever encountered and the manner of construction is most unusual - the fortress is literally carved out of the rock. So strong is the design that it was only the development of “modern” artillery in the late 19th Century that it became obsolete. Most impressive of all is that the castle is still in almost pristine condition, all that is missing are the troops and some of the guns. The landscape created the perfect site for a castle. Steep hills rise from the river valleys and the highest of these are capped by shear sided tables of hard sandstone. Erosion has cut natural towers and pinnacles from the edges of these so that a strong fortress can be created simply by blocking the few pathways to the summit. The Konigstein rises immediately above a bend in the Elbe and the cliffs are close enough to allow even a trebuchet to dominate the river. The sheer strength of the 16th Century fortress meant that it was never besieged, although it did play a part in the complex history of the region as an administrative centre, palace and prison. The earliest written reference to the castle dates from 1233. During the 14th Century the castle consisted of at least three buildings, The Kaiserburg and Mountain House, which are now incorporated into the main range of buildings, and a separate chapel, which is substantially intact and still in use. During the 15th Century the decision was taken to upgrade the castle into a strong fortress capable of withstanding the artillery of the time. The initial task was to sink a well from the summit of the rock down 152.5 metres to an aquafer capable of supplying 8000 litres of water a day. This is the second deepest medieval well in Europe. In 1589 work began and by 1600 the fortress was essentially complete. Between 1729 and 1802 further works were carried out including strengthening the entrance, the construction of substantial outworks and upgrading the barracks and armouries. In the late 19th Century it was strengthened further with the addition of inner earthen ramparts, the latest artillery and deep bunkers for storing munitions. Despite this, by the 20th Century improvements in artillery rendered the fortress indefensible and its military function ceased in 1920. Fortunately the buildings continued to be used so we have inherited an almost pristine example of a fortress that bridges the period from the end of the middle ages to the beginning of modern warfare. Although it is possible to drive up to the base of the ramparts my son decided to do things the hard way so we started our climb from the small town of Konigstein located on the banks of the Elbe - this gave us a chance to look up to the ramparts of the castle towering far above. The castle was hidden during most of the steep climb from the valley and it first became visible from a about a mile’s distance, as we emerged from the valley. At this point the unusual, if not unique, construction became evident. 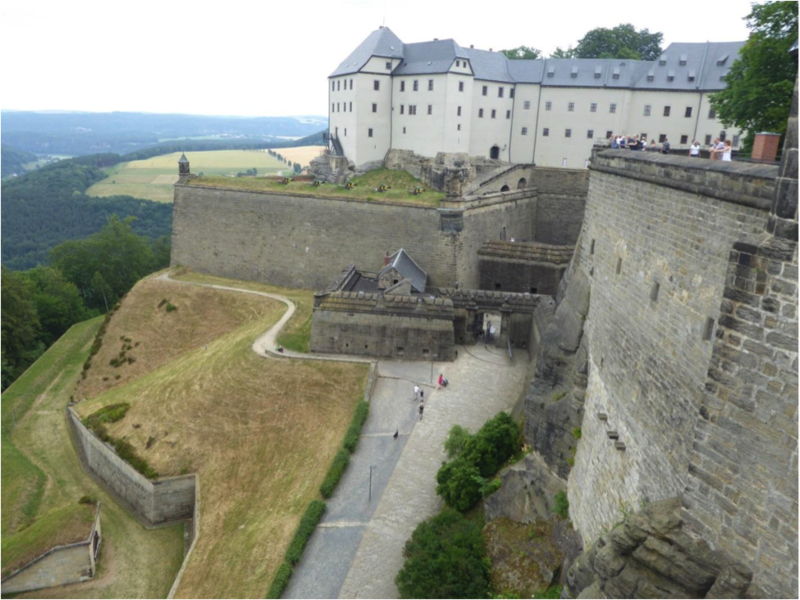 Many fortresses are perched upon a rock but the builders of Konigstein carved the lower part of the rampart from the rock so that it rose shear and smooth from its base. The natural rock pinnacles have been formed into flanking towers and bastions. The cut rock has a golden colour which makes the fortress visible for miles. The white buildings of the main range contrast strongly with this and my first impression was of a palace or hotel perched on the rock. The approach takes you under the walls and beneath the outworks to a deceptively simple outer gate, just a gap in the ramparts guarded by a draw bridge and flanking gun port. However any attacker arriving here would have been under fire for a considerable time and would now be standing immediately beneath the main rampart. Outer Bastion showing anti-personnel spikes embedded in the parapet. Inside the gate a cobbled road curves around the base of the rock and rises steeply to the main entrance. As it rises the extent of the impressive lower outworks becomes apparent, a double line of ramparts and a protruding arrow shaped flaeche at the point. The road passes an outcrop of rock which has been carved into a rectangular bastion, from this point an attacker would have been fired upon from the rear as well as front and side. At the top the way is barred by two low ramparts set within a narrow gorge, these are typical of the entrance to any artillery fort. After passing through the first arch the road enters a small courtyard, overlooked by the main ramparts on three sides, and turns through 45 degrees before passing through the second gate. At this point you are faced by a ditch cut in the rock, with the main gatehouse towering above this. The gate is several meters above the courtyard and reached by climbing a sloping wooden bridge. Beyond the entrance the raod enters a long tunnel, which also slopes steeply upwards and which has several additional gates. The upper half of the tunnel is a long, high, gallery with gun loops set in all four walls so that any attacker, had they managed to get this far, would receive fire for all four sides. The final gate is set at right angles to the tunnel and opens into to a deep trench which finally rises to the summit of the plateau. At this point the shear size of the fortress becomes evident. It’s not possible to see the far end as this is obscured by a sizable wood and the site has the feel of a barracks rather than a castle. We did not have time to explore the main range of buildings but took a circuit around the walls and explored some of the other buildings scattered across the plateau. One surprise was finding many original cannon, in very good condition, emplaced in the original batteries, although little remains of the late 19th Century artillery. One oddity is the Friedrich Castle, a Baroque pavilion used by the nobility as a banqueting hall. Main building. The original castle is at the right hand side. One of many bronze cannon present on rampart. It’s in better condition than the Author. River Elbe. The rock on the opposite bank gives an idea of how the original castle would have looked. A grimmer find was the plague casement, a subterranean chamber where plague victims could be confined until they died or recovered. Plague would have been the biggest threat to this impregnable fortress. This being Germany, we were able to stop for a good beer and barbequed sausage, en-route. Our final stops were the treasury and well house. The latter is worth a visit on it’s own. The outer chamber contains a huge treadmill which was used to raise barrels of water. Beyond this is the well chamber. As previously mentioned the well is huge and the well master was obliged to descend to the bottom in a barrel once a day. 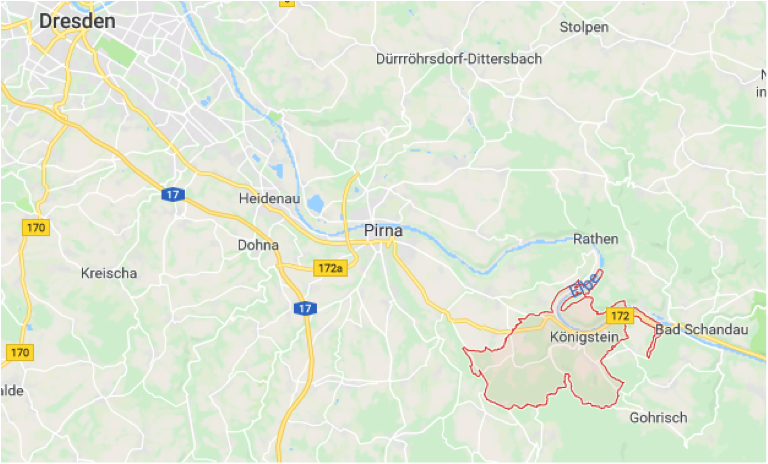 Konigstein is located about an hour’s drive south east of Dresden and can also be reached by rail from Berlin. There is a small town at the base of the rock which provides accommodation and has a “road train” for those who want to avoid the climb. The Loire Valley in its own right is a beautiful sight to behold. Nearly 300 kilometres in expanse in central France along the Loire River, the 800 or so square kilometres known locally as the Vallée de la Loire is famous for its wine-producing vineyards, among other agricultural products. Also bestowing the nickname the “Garden of France” are the farms that produce artichokes, asparagus, and orchards which produce cherries and apples, among other delicious fruity varietals. Perhaps most notable about the region are the area’s amazing castles that span a huge variety of shapes and sizes. The spectacle of gothic architecture that date some 600 years back is enough that the UN added the region to its list of UNESCO World Heritage Sites. But which among the towering castles are deserving of extra attention? It is not easy to narrow down the best of Chateaux of the Loire Valley, but here is an honest attempt at a few to take a closer look at. The sleepy oat-meal town right on the River Loire pay tribute to the majestic beauty that is Amboise chateau. You have to see it to believe the former home of Kings Charles and Francois Louis, full of towers adorned with ramps that made horse-drawn carriage an adequate substitution when elevators did not yet exist. The chateau itself is, like all those on this list, lovely in its own rite. But the star of the show are the geometrically laid-out gardens, meticulously terraced in set squares. From a bird’s eye point of view, the gardens are perfect, looking like something out of a puzzle. This Renaissance estate is host to more than 350,000 visitors every year who walk around the gardens, and for good reason. You have never seen anything quite like these gardens. One of the most famous for its simply romantic setting, Chenonceau castle has the iconic arches over the River Cher. Also home to some incredible gardens where Catherine-de-Medicis threw some raucous parties back in the day, there is also world-class art for connoisseurs to take in. Chateau of Ussé is famous for providing the inspiration for none other than Charles Perrault’s castle in Sleeping Beauty. This was rebuilt in the 1400s to add on some Renaissance features to complement its medieval aesthetic, such as the dormant windows and gothic towers. The unforgettable chimneys are the proverbial cherry on top. In February 2009 Philippa Langley launched the Looking for Richard Project. As close friends and fellow Ricardians we joined forces with Philippa to become the project’s founding members, working behind the scenes on documentation and guidance. Our principal objective was to recover King Richard’s remains and reinter them with the honour and dignity so brutally denied in 1485 following the battle of Bosworth. We now wish to correct a number of important misconceptions about the project and make clear why we are now actively supporting the campaign to inter King Richard’s mortal remains in York Minster. My first degree, at UEA in Norwich, was a joint degree – history and French. Subsequently I did an MA in linguistics and a PhD in history. So my life always had two focuses, and I enjoyed moving back and forth between them. For a number of years I taught languages, both in this country and abroad. But I always did historical research, and published papers and later books, and also gave talks on history. For the last twenty years or so I've been a freelance historian, and although I have wide interests in history - including an interest in Egyptology and – through my own Anglo-Indian background – in the history of the Raj, my focus in my writing and lecturing has always been on fifteenth-century England. Q1. What first got you interested in history? A. It was seeing large posters of ancient classical sites in travel agents windows when I was around 7, I would ask them to save the posters for me when they took them down and I had them on my bedroom wall. About the same time I started to visit museums. Much to my Mother's annoyance I would be more interested in gazing around at the architecture of churches than the service. When I was still at school I worked on Roman Kiln digs at Doncaster and pot washed finds in the museum. After saving money earned from Saturday jobs and walking dogs at 16 yrs I finally made it to Italy together with my classmate Susan to visit sites, a dream come true. David holds a PhD in History; his thesis focused on the English Civil War, examining the collapse of the parliamentarian war effort during 1643. He is currently researching the political controversy surrounding Richard III’s accession in 1483. Wendy has an abiding fascination for all aspects of Medieval life. Although her particular field of interest is the fifteenth century, she is also interested in the Angevin kings of England, as well as the Civil Wars of the seventeenth century. David and Wendy met through a mutual interest in Richard III. What period of English history attracts you the most? A. The Wars of the Roses because it belonged to King Richard III. The hunchback version of Richard fascinated me as a child, and when I grew up and learned about the kind of man he was, the entire period of the Wars of the Roses came to dominate my interest. The Wars of the Roses has great drama and turbulence. It may surprise some that it is incredibly significant to world history, not just to England. That’s because the laws Richard III bequeathed us in his one and only Parliament flowered into modern Western democracy three hundred years later in the hands of the Founding Fathers of the U.S., and from there was transplanted all over the world. Q1. How did you first become interested in history? A. I’m not exactly sure (I caught the bug early! ), but my parents are both passionate about history so that must have helped. I was also very fortunate to grow up in a house full of books, and to have parents who encouraged my love of reading. By the time I was seven or eight I was a regular visitor to the local library (now sadly closed), which had an excellent children’s history section. When I was a little older I became an avid reader of a brilliant series of books by Harry T. Sutton (which used to be available in National Trust shops).